This document is copyright 2000 by Tony Cox and Pat Rowell. All rights reserved. 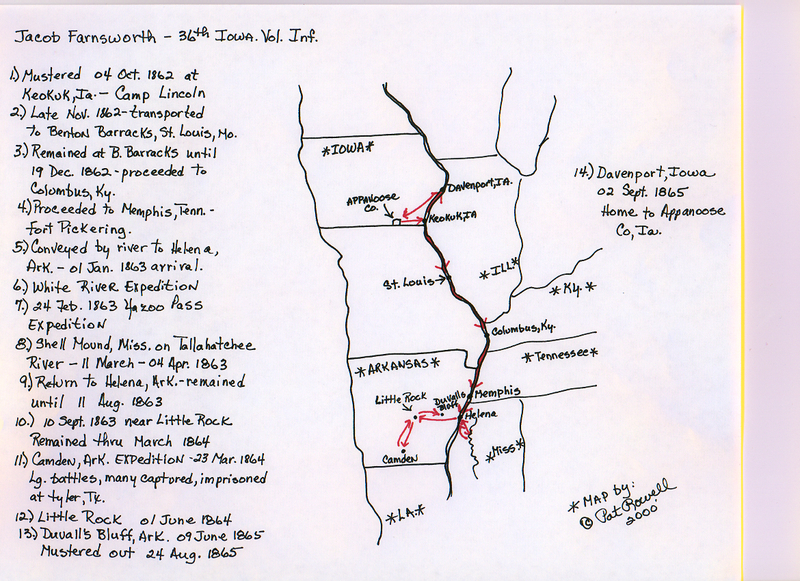 There are two maps that depict the path traveled by the 36th Iowa regiment. The first is an overview of the entire campaign. 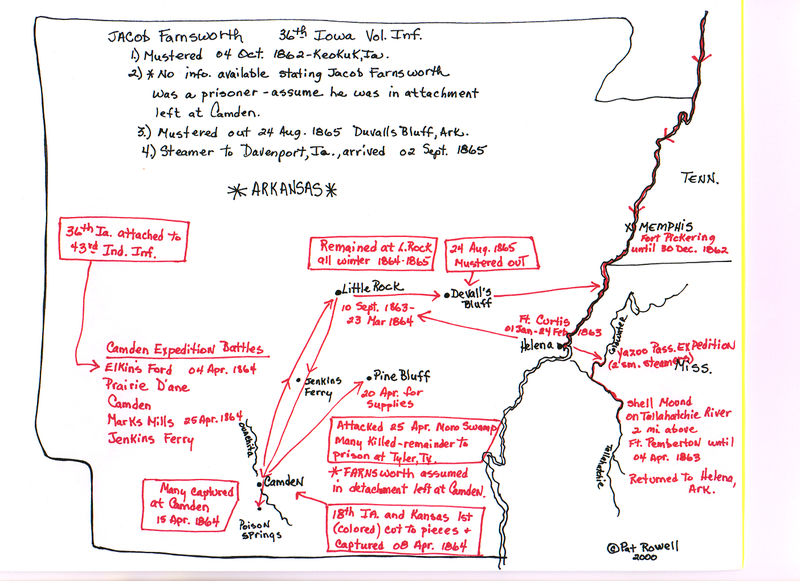 The second map details the action in Arkansas. Use the back button on your web page browser to return to the previous page. This sketch is a short version of the Historical Sketch of the Thirty-Sixth Regiment, Iowa Volunteer Infantry taken from the Roster and Record of Iowa Soldiers in the War of the Rebellion Vol. V, pages 615-623. This is the regiment in which Jacob Farnsworth volunteered to serve. He was 28 years old, resided in Appanoose County, Iowa, and was a native of Ohio. He enlisted 11 August, 1862, mustered 04 October, 1862. He was promoted to Eighth Corporal 12 October, 1863; Fifth Corporal on 23 March, 1864; Fourth Corporal on 20 April, 1865; Third Sergeant on 01 June, 1865. He, along with his regiment, mustered out of service 24 August, 1865, Devall’s Bluff, Arkansas. The Thirty-sixth Regiment was organized under the proclamation of President Lincoln, issued July 2, 1862, in which the Governors of the Northern States were called upon to furnish additional troops for the suppression of the Rebellion. The ten companies of which the regiment was composed were recruited in the southeast part of the Sate, and were ordered by Governor Kirkwood to assemble at Camp Lincoln, near Keokuk, Iowa. The organization was completed, were mustered into service of the United States on the 4th day of October, 1862. The strength of the regiment was nine hundred eighty six men. Late in November, 1862, the regiment embarked on transports, conveyed to St. Louis, Mo., where it remained at Benton Barracks until 19 December, 1862. At this time, they proceeded down the river, were detained for a short time at Columbus, Ky., for the purpose of reinforcing the garrison and to aid in repelling a threatened attack of the enemy. The attack was not made and the regiment proceeded down the river to Memphis, Tenn. The regiment was assigned quarters at Fort Pickering, where it remained until 30 December, 1862. Upon this date they were conveyed to Helena, Ark. They remained at the barracks at Fort Curtis until 24 Feb., 1863, when they left on the Yazoo Pass Expedition. The regiment had by this time suffered from diseases and weather, left on this expedition with only six hundred enlisted men, leaving the sick and convalescent in hospitals and camp. They embarked on two small steamers. Navigation on the Coldwater and Tallahatchie Rivers was very difficult and tedious, owing to the narrow and crooked streams and overhanging trees which had to be cut away. They arrived at Shell Mound, were ordered ashore, formed in line of battle to support two other regiments. They remained about two hours under fire and were ordered back to the boats, returned to Shell Mound, and remained there until April 4th. The regiment returned to Helena, where they remained until 11 August 1863. At this time the regiment joined in the expedition against Little Rock, arriving in the vicinity on Sept. 10th. It is noted that more casualties have resulted from diseases at this point than from battle. During January, February and March of 1864 the regiment received over two hundred recruits from Iowa. They left on the Camden Expedition on 23 March, 1864. The expedition was a very hard and disastrous one. They were brigaded with several other units (the Forty-third of Indiana and Seventy-seventh Ohio Infantry, Battery E, Second Missouri Light Artillery). The regiment participated in battles of Elkin’s Ford, Prairie D’Ane, Camden, Mark’s Mills, and Jenkins’ Ferry, fighting with honor in every battle, and at Elkin’s Ford and Mark’s Mills with glory. During these skirmishes, a squadron of cavalry with forty government wagons loaded with corn, was ordered to Britton’s Mills, took possession of the mill and commenced grinding corn. On this same day, a train of one hundred wagons was cut to pieces and captured. On the morning of April 25th another train was attacked while crossing Moro Swamp, and a terrible and bloody battle ensued. The rebel force outnumbered them six to one. They were overpowered and captured. The Thirty-sixth Iowa went into the fight with about five hundred men, and lost nearly two hundred. The remainder were now in prison at Tyler, Texas. It was stated that only one hundred fifty of the command had escaped, the rest were made prisoners. The remainder of the regiment returned to Little Rock in May 1864. They remained encamped here for the greater part of the time during the winter of 1864-65. Part of this time they were stationed at Devall’s Bluff and Saint Charles. At St. Charles they were reunited in April with those who survived the horrors of imprisonment at Tyler, Texas. They had been released from prison in February, sent to their homes in Iowa, and those being sufficiently recovered, rejoined their regiments. The regiment moved to Devall’s Bluff, Ark., on 09 June, 1865 where it remained until 24 August, 1865, upon which date it was mustered out of the service of the United States. It was then conveyed by steamer to Davenport, Iowa, where it arrived 02 September, 1865, and was disbanded. The survivors of the regiment then returned to their homes.